Recently I went to this restaurant which had some awesome Italian dishes of which their Roasted Fennel Soup blew me away! 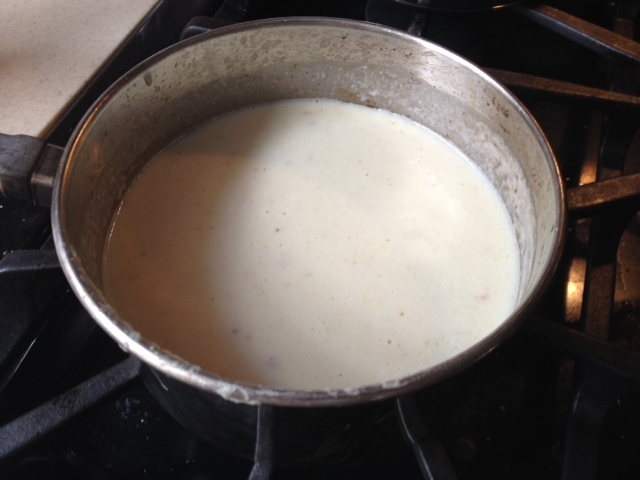 The soup was delicious and I made up my mind to recreate that dish excepting I did not want to use potatoes. The roasted fennel soup in the restaurant had potatoes which according to their Chef helps make the dish thicker in consistency and creamier. I tried to recreate the same soup at home minus the potatoes 🙂 I would love to share this extremely delicious yet healthy dish with all of you today. 1) Take a baking pan and cover it with aluminum foil to avoid messy clean ups:) The first step is to chop the fennel bulb. How to chop the fennel bulb? Chop the fronds or the tiny spikey leaves off the fennel bulb. 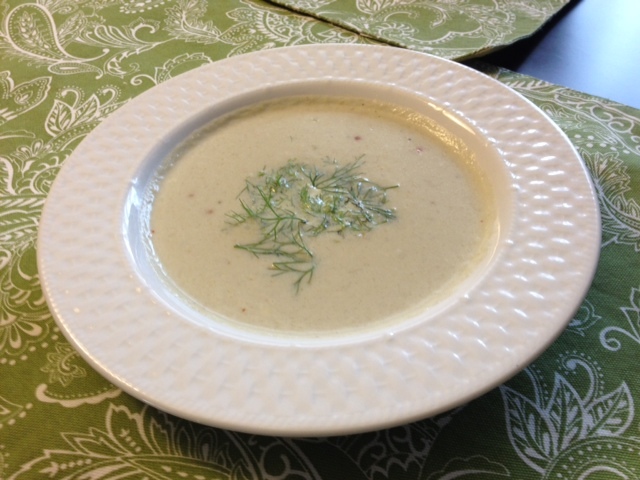 DO NOT THROW away the fronds as it is very flavorful and can be used as a pretty garnish for the soup. 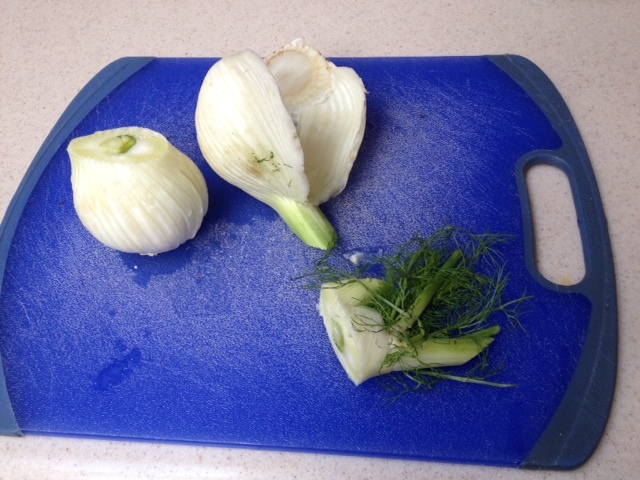 Take off the outer layer or leaf from the fennel bulb and then cut in half. 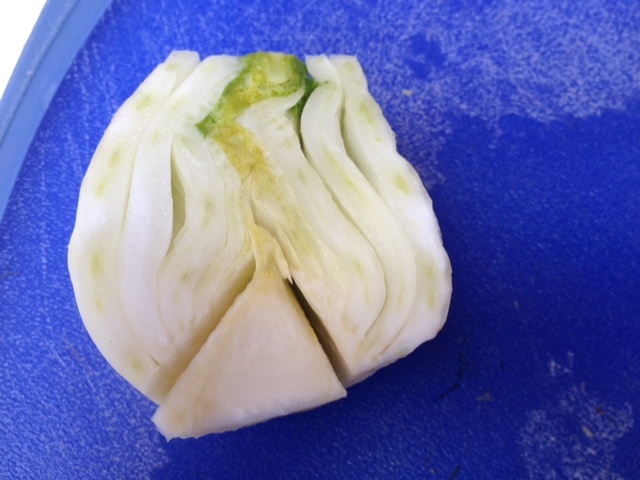 Similar to onions, fennel also have a core at the bottom that has to be removed carefully using a knife. I usually cut a V shape around the core and dice it out. Now wash the rest of the fennel and chop evenly into small uniform pieces. Transfer the chopped fennel pieces to the baking pan covered with foil. 2) Dice a medium Onion evenly and transfer to the pan with chopped fennel pieces. 3) Chop garlic finely and transfer to the pan with chopped onion and fennel pieces. 4) Drizzle olive oil along with salt, cayenne, lemon pepper and garlic powder and toss to mix well. 5) Stick the baking pan in the oven at 360 F for about 45 minutes. 6) Once done, take it out of the oven, let cool and transfer to a food processor or blender. 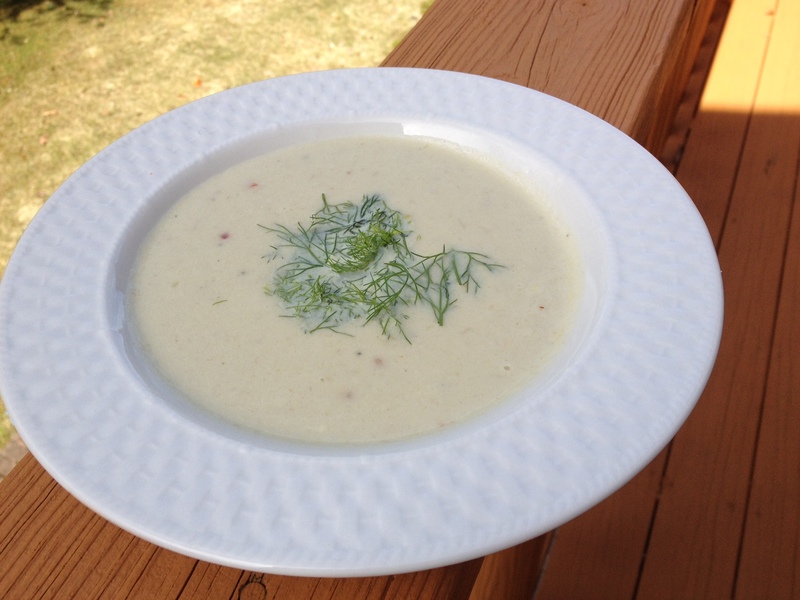 7) Blend the pieces of baked and chopped fennel, onion and garlic along with vegetable broth. 8) Transfer the blended mixture to a pot and check seasoning and add 2 tablespoon of milk (to add creaminess to the texture) and wait till it boils. 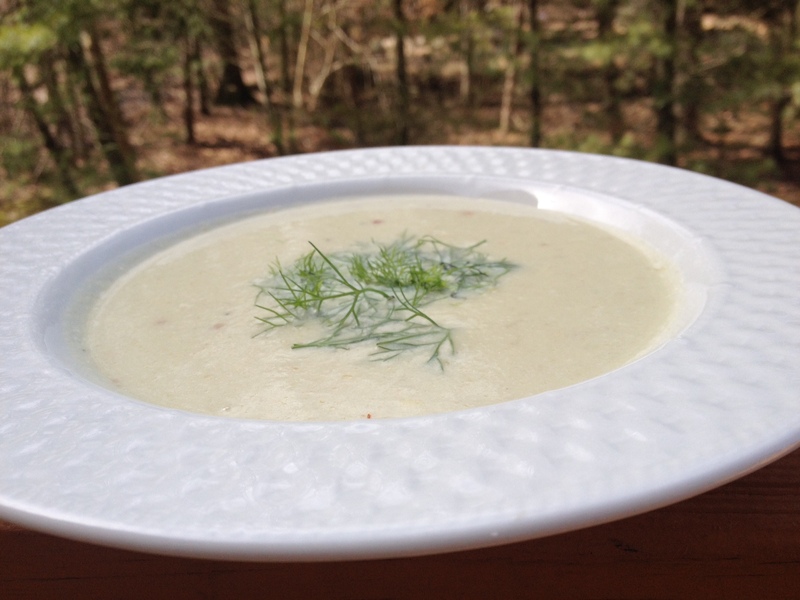 9) Your roasted fennel soup is ready and you may garnish it with the fennel fronds. It looks delicious and tastes even better!